Setelah sukses membangun test tower nya G1 (213,5m) kini mereka mengumumkan akan memecahkan rekor yang di pegang Mitsubishi (1080mpm). Tokyo, Japan and Guangzhou, China, April 21, 2014 — Hitachi, Ltd. (“Hitachi” / TSE: 6501) and Hitachi Elevator (China) Co., Ltd. (“HELC”) today announced that they will deliver the world’s fastest ultra-high-speed elevators with a speed of 1,200 m/min (72 km/h) to the Guangzhou CTF Finance Centre (530 meters tall), a mixed-use skyscraper currently under construction in Guangzhou, China, for the full opening of the building in 2016. The elevator will feature technologies that support safe and comfortable elevator operation, in addition to the drive and control technologies needed to attain the world’s fastest speed. Through these technologies, Hitachi will ensure that the elevator will provide passengers with a comfortable ride even when operated at high speeds. Hitachi has taken the lead in developing elevator products that satisfy the demands of increasingly taller and larger buildings over the years. Notably, in 1968, Hitachi developed Japan’s fastest elevator at the time, with a speed of 300 m/min. The elevator was installed in the Kasumigaseki Building, Japan’s first skyscraper building. 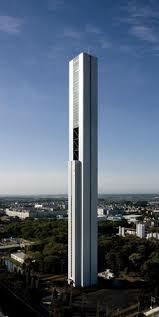 In 2010, Hitachi started operating the 213-meter tall G1TOWER, the world’s tallest*2 elevator research tower. Here, Hitachi has been conducting many different field trials needed to support growing global demand for high-speed, large-capacity elevators, along with pursuing technology development for elevator products that satisfy safety, comfort and environmental considerations. The 1,200 m/min ultra-high-speed elevator that Hitachi will deliver will feature both the drive power needed to attain the world’s fastest speed, and also reliable control capabilities. 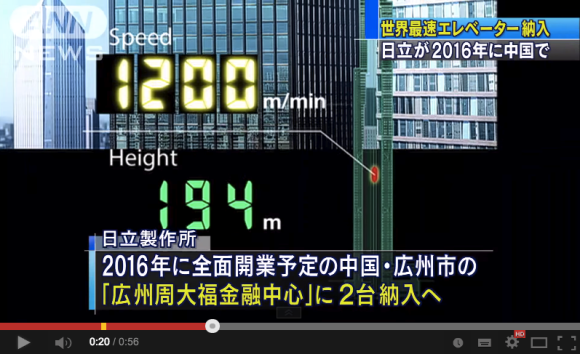 The elevator will travel a shaft height of 440 meters from the 1st to 95th floor in approximately 43 seconds. Furthermore, Hitachi will achieve both high-speed elevator operation and a safe, comfortable ride by using braking equipment and a governor*3 that safely bring the elevator to a stop, as well as technologies to prevent lateral vibration and to reduce the sensation of ear blockage caused by air pressure differences. Hitachi will install a total of 95 elevators at Guangzhou CTF Finance Centre, consisting of two of the world’s fastest elevators announced today with a speed of 1,200 m/min; 28 double-deck elevators; ultra-high-speed elevators with a speed of 600 meters per minute; and other elevators. Looking ahead, Hitachi will continue working to develop elevators offering various forms of added value, in order to support the construction of taller and larger buildings, for which demand is expected to further increase, mainly in overseas markets. Moreover, Hitachi will utilize the new technologies and insights obtained through these development activities for ultra-high-speed and high-speed elevators and other products, in order to provide safe, comfortable and convenient building environments on a global basis. Hitachi is strengthening the global rollout of the Social Innovation Business. It will continue to expand the elevator business, which represents an essential vertical transport infrastructure for urban centers. Developed a permanent magnet synchronous motor that achieves both a thin profile and the high output needed to attain a speed of 1,200 m/min. Successfully developed a compact traction machine by lightening the load on the traction machine, through reducing the weight of the system by reducing the main rope diameter while increasing the rope’s strength. Installed inverters that possess one of the world’s highest capacities for use in elevators to control the output of the large-capacity motor. At the same time, Hitachi has successfully conserved space as regards the control panel. Developed brake equipment using braking materials with outstanding heat resistance to safely stop the elevator car in the unlikely event that an elevator malfunction is detected during ultra-high-speed operation. Thoroughly ensure safety and save space by using a single governor that can control different rated speeds during elevator ascent and descent*4. Installed active guide rollers that detect minute warping in the guide rails and lateral vibration due to wind pressure, in the four corners (top and bottom, left and right corners) of the elevator car. This gives elevator passengers a comfortable ride even during high-speed operation. Reduced the sensation of ear blockage by developing Hitachi’s proprietary air pressure adjustment technology, which reduces the changes in air pressure inside the elevator car that would otherwise be caused by the vertical movement through long travel. The rated speed during descent is 600 meters per minute. Guangzhou CTF Finance Centre is an upscale mixed-use skyscraper that provides office, hotel and residential space with 111 above-ground floors and 5 below-ground floors, and has a height of 530 meters. 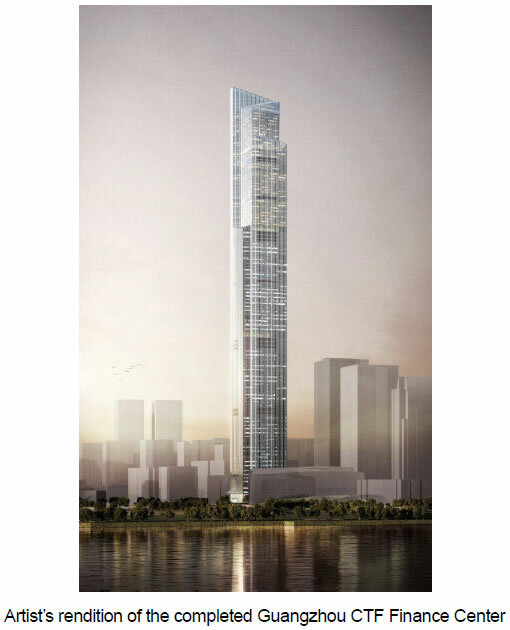 It will be the tallest building in Guangzhou, China. Construction of the building is now under way in the city’s Tianhe District, with the aim of fully opening the building in 2016.